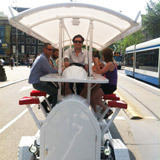 Making a tour through Amsterdam by the Participants on a beer bike made ​​available by us. LimoBike, a company located on the address Spuistraat 74a, 1012 TW Amsterdam, the Netherlands. The confirmation of the Event received by the Customer including further details thereof such as date, start time, departure location, delivery location, costs, terms of payment and deposit. All bookings for the Event which have been accepted by a Booking Confirmation by us are subject to these terms and conditions. 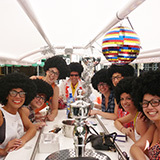 If Customer also uses any of our other services, then the relevant terms and conditions hereof apply supplementary, but the conditions for the beer bike prevail for this Event. The applicability of any general terms and conditions of Customer is expressly excluded. 3 a. 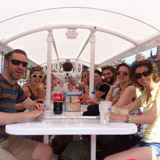 The beer bike is rented for the period specified in the Booking Confirmation. The Participants have to be present at the time and the location indicated in the Booking Confirmation. If the Participants are too late, the cycle time is reduced by the time the Participants are late without any entitlement to a pro rata refund of the original rental period. In case of being too late, the rental period can, on request, be extended at extra cost in accordance with the rates from the Booking Confirmation provided the beer bike is still available at the later time. 3 b. 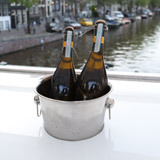 In the rent a vessel of 30 liters of beer is included. This is not replenished when it runs out. Participants may not hand out and / or sell beer to third parties. If the Customer has not paid the rent to us ultimately 30 days before the date of the Event, we reserve the right to cancel the reservation. The beer bike will not be returned, whether or not due to leaving the beer bike prematurely, on the time and location indicated in the Booking Confirmation. In the above cases, the deposit will be maintained partially or wholly by us. Whether the deposit is only partially retained and if so, which part, is entirely to our discretion. Before starting with the beer bike we require the Customer to identify himself by showing us a valid ID. By entering the reservation Customer agrees to be familiar with the operation of the beer bike and Customer acknowledges that the beer bike meets the purpose for which he hires the beer bike. 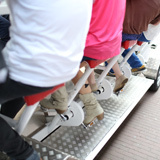 Participants will use the beer bike solely for the purpose for which it is manufactured. It is not allowed to Participants to put items in the beer bike through nailing, stapling, screwing or otherwise. 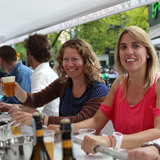 Customer is aware that at least 6 Participants are required for the movement of the beer bike. 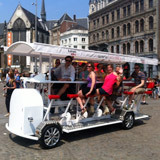 Participants will not leave the beer bike during the trip. Less than 30 days before the date of the Event = 100% of the rent. an insufficient number of Participants (= less than 6 Participants). 9 a. The Participants are required to behave themselves in a way that they will not cause any inconvenience to third parties. Behavior that we see as causing inconvenience to third parties includes but is not limited to: loud shouting, searching for contact with others who do not appreciate this, drinking beer in places where this is not permitted according to the instructions of the driver and puddling on the street. 9 b. We provide a driver that determines the route of the trip. The route the driver determines is binding on the Participants. Any instructions from the driver to the Participants will be succeeded by the Participants. The Participants must behave respectfully towards the driver. If this is not the case in the opinion of the driver, or if Participants at the discretion of the driver do not adhere to the stipulations of article 9 a, we are entitled to terminate the Event, and requesting the Participants to leave the beer bike during the route without any right to a refund of the rental fee paid and / or the deposit. 10 a. In the event of too late return and / or damage to the beer bike, for whatever reason, the Customer is therefore in default towards us without any notice of default being required. The Customer then is, without prejudice of any other obligations towards us, obliged to pay compensation to us. In case of late delivery back this compensation amounts to the price per hour for each hour that the agreed rental period is exceeded plus 50% of that price. In case of damage to the beer bike the Customer will be due the cost of repairing the damage as well as the rent per day for each day necessary for reparation increased by 50% of that rental price. The deposit will first be used to meet this damage. 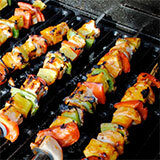 If any damage amount then remains the Customer will be liable. 10 b. Customer will indemnify us for any damage caused to third parties by any act or omission by the Participants during the trip or otherwise related to the reservation. 10 c. In case of damage we will hold the Customer liable. Customer can not escape from liability towards us by stating that not he, but not any of the other Participants caused the damage. 10 d. The Customer shall inform Participants that they are required to sign a disclaimer of liability on the day of the Event before the beer bike leaves. 11 a. We can not be held liable for damage, loss of property, injury or death which is suffered by a Participant when he was under the influence of alcohol or any other drugs. 11 b. We can not be held liable for damage, loss of property, injury or death which is suffered by a Participant that is the result of failure to follow instructions of the driver and / or us. We are at all times entitled without giving reasons not to execute or cancel a rental agreement unilaterally if there are reasonable grounds for suspecting that the Participants will not comply with the provisions of these conditions or otherwise by participation in this Event will cause an unacceptable risk – whether or not to others. It is not allowed for Participants to (sub)let the beer bike, whether or not for a fee. 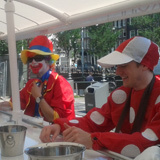 All disputes arising from the reservation of the beer bike are subject to Dutch law and will be submitted to the competent court in Amsterdam.